This has been a superb experience for my family. It was a BIG occasion for me & your EXCELLENT CARE and SERVICES made it even bigger & better for us. Right from the doctors, to the paramedical staff, support staff and housekeeping staff were just great, well skilled, well behaved and communicative. They all made the tensed and crucial moments a lot easy and relaxed. 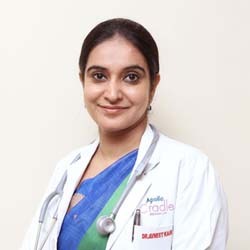 A special mention of few names: – Dr. Leena, Dr. Arpita, Dr. Ginni, Dr. Avneet, Sr. Dr. Chandrakanta for their medical care and advice during and post procedure. Support staff: – Daljeet, Jyoti, Renu, Asha, Seema for their “round-the-clock” care & support. Them aside, everyone at Apollo Cradle as well has been greatly supportive. God blessed us with a HAPPINESS and all you at Apollo Cradle DELIVERED it!